STOP n L@@K at the savings on LegendJr Extreme basketball goals! BuiltRiteBleachers.com beats the competitions prices on outdoor fixed height basketball systems . The Legend Jr. Fixed Height Basketball Goal offers a combination of playground durability and professional performance! The Legend Jr.'s vertical post and extension arm are both constructed of rugged 5" square 3/16" thick tubular steel. Combined they provide top-notch performance in both durability and rigidity. The post is set back 52" for added safety. The extension arm on the Legend Jr. is attached to the vertical post using six high tensile 5/8" bolts. Though the Legend Jr. is considered a "Fixed Height" goal, the extension arm can be bolted at any height along the post. First Team offers a large selection of basketball backboards and rims with the Legend Jr.Fixed Height Basketball Goal. Choose a Legend Jr. package with one of our Response™ tempered glass backboards if you are wanting authentic gymnasium style ball reaction. For added safety, pole padding and backboard padding are available for most Legend Jr. packages. Every Legend Jr. 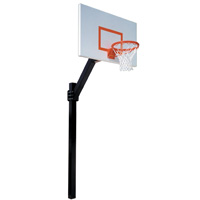 Fixed Height Basketball Goal package comes with a Lifetime Superior Warranty.